Scotland is world-renowned for its salmon and trout fishing opportunities, and nowhere more so than the Highlands where stunning rivers and impressive lochs abound. The River Helmsdale offers some of the best salmon fishing in the world and people travel from far and wide to fish this great river. The salmon and sea trout season opens on 11th January with an official Open Day Ceremony and, on this day anyone may fish the river for free and hundreds of anglers come to the area to do so. 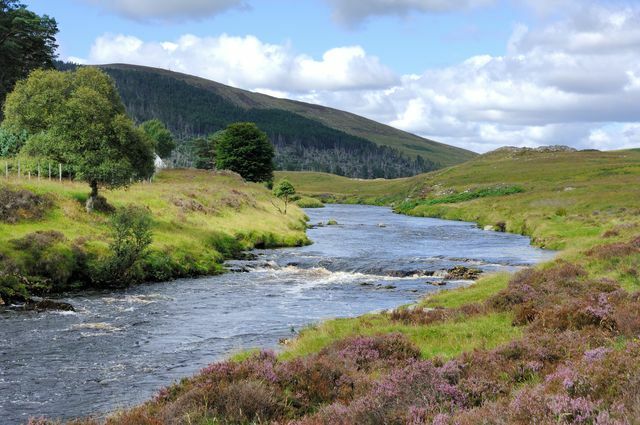 For the rest of the season, until the river closes on 30th September, visitors may obtain fishing permits for the Association Water, the 1.5 mile stretch of river closest to Helmsdale which has a number of good pools and fast streams. Individual and family tickets are available on either a daily or weekly basis and, whilst it is often possible to buy these at relatively short notice, it is worth booking in advance as only eight tickets are issued a day. The rest of the river is split into 12 beats (6 above Kildonan Bridge and 6 below) and shared between 6 proprietors, Suisgill being one of them, who are allocated an above and a below beat each day on a rotational basis and allowed just two rods on the river a day. In terms of Suisgill rods, we let our fishing on a weekly basis and due to repeat visitors it very rarely comes available but we do operate a waiting list for those who wish to express an interest and may get in touch if any fishing does become free. For more information, please email us at lettings@suisgill.co.uk. Other local salmon rivers include the River Brora, the Halladale and the Thurso. The quality of Sutherland’s wild brown trout fishing is second-to-none and Suisgill is an excellent base to explore the many lochs in the area. The Scottish brown trout season runs from 15th March to 6th October, with some local lochs finishing their season on 30th September. On Badanloch Estate, at the very top of the River Helmsdale, there is a three-loch system comprising of Loch Rimsdale, Loch Nan Clar, and Loch Badanloch (home to the famous Badanloch dam which was built in the 1900s with the purpose of maintaining water levels on the Helmsdale). With 5 boats available on what amounts to around 2,300 acres of water, you will not be competing for space! There is also the possibility of trout fishing on the mile-long stretch of the Helmsdale river between Loch Achnomoine and the dam. Prices: boats £20 per day for up to three people per boat; bank £10 per day per person and river £25 per rod with a maximum of two rods on the river. Click here for more information about trout fishing at Badanloch.